On average, noise coming through a ceiling is the worst soundproofing problem you’re likely to encounter. The reason is two-fold. First, the hard flooring choices of today don’t help the noise control problem at all. Carpet and pad is used to reduce a lot of the noise. Hardwood, linoleum and tile are not the friends of the neighbour below. Second, a footfall introduces a great deal of energy into a very small cross section of floor. This can overwhelm many common soundproofing efforts. Here’s what you’re up against. Imagine your neighbour’s footstep hitting the floor above. This large amount of vibration will race through the flooring above and start entering your ceiling framing. The framing is VERY conductive, so vibration passes through very easily. 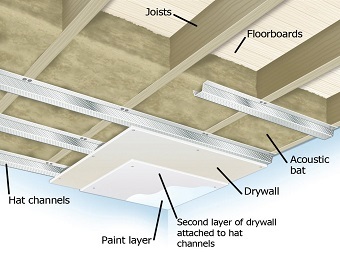 Your ceiling drywall is rigidly attached to this vibrating framing, so a millisecond after the footstep slams the floor, the vibration enters your ceiling drywall and then hits you. For this high level of isolation all 4 Elements of Soundproofing should be deployed: Decoupling, Mass, Absorption and Damping. When designing any soundproofing solution, we would always prefer to treat the noise at its source. This allows us to control and reduce the (sound) vibration before it enters the building’s framing. 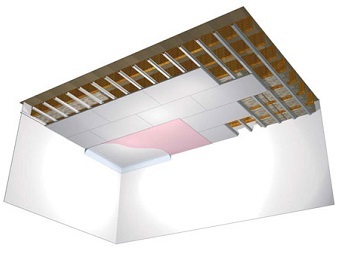 If the vibration enters the framing, the very conductive framing materials can carry that vibration a great distance. 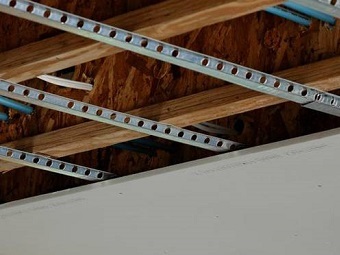 If we could treat the floor above to immediately destroy the vibration before it gets into your ceiling framing, things would be a lot easier. With a hard finished floor above, however, this is generally not possible, and he probably doesn’t want to help you anyway. So really all you can do is treat the ceiling on your side.